от 25 шт. — 45.30 руб. 53 руб. 2-3 недели, 500 шт. 25 шт. 25 шт. 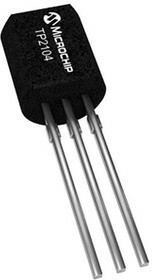 The Supertex range of P-channel enhancement-mode (normally-off) DMOS FET transistors from Microchip are suited to a wide range of switching and amplifying applications requiring a low threshold voltage, high breakdown voltage, high input impedance, low input capacitance and fast switching speeds.